"Ending military rule is a step in the right direction," stated former head of the International Atomic Energy Agency (IAEA) and prominent political figure Mohamed ElBaradei on his official Twitter account Sunday, about President Mohamed Morsi’s recent decree. 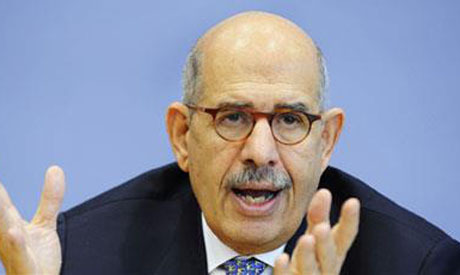 ElBaradei, however, warned that leaving both legislative and executive authorities in the hands of the president conflicts with the core principles of democracy and should only be a temporary measure. The best way to manage the transitional period, ElBaradei suggested, would be to form a new constituent assembly representative of Egypt’s diverse society that would assume the legislative authority until new parliamentary elections take place. This is a model Tunisia adopted following the ouster of former president Zine El-Abidine Ben Ali in 2011. On Sunday, President Morsi cancelled the contentious 18 June constitutional addendum issued by the Supreme Council of the Armed Forces (SCAF) which empowered the military, while sending SCAF head Field Marshal Hussein Tantawi and Chief of Staff Sami Anan into retirement. Morsi then released a new Constitutional Declaration transferring all the powers to the president. Morsi’s bold move was believed by many to have been a significant transfer of power from the armed forces to civilian hands, bringing an end to decades of military rule in Egypt. However, the military restructure and shift of power ensures that the president now has full legislative and executive authority, raising further concerns that the president's organisation, the Muslim Brotherhood, could seize complete control of the country. Baradei can shut up. He spent his whole miserable life in the service of the hyper powers; now foul mouthing Egyptian elected president for sacking a few anti Egyptian generals who were, just like Baradei, wholly in service of foreign interests. The Military leadership is not to blame. You can not blame the military leadership for the cowardly attack that took place in the Sini desert. No army can defend itself against such sudden attacks by suicidal individuals.